I’m in love with my YA Romantic Comedy. Hopefully, you’ll see A PERFECT FIT out in the world soon. Wearing a vintage bombshell dress with a faux fox stole to school might be considered social suicide, but seventeen-year-old Ren couldn’t care less. As long as she can hang out with her best friend, Kalli and Kalli’s twin brother, Kit, plus wear vintage clothing and ace AP Trig, life’s nearly perfect. However, if she could indulge a few secret wishes, she’d like to make the cheering team—even though she’s anything but athletic—and catch the attention of high school hottie, Craig. Not that Craig’s aware of her existence. But whenever Ren wears her latest thrift shop find, sparkly shoes, odd things happen. The head cheerleader—who mocked Ren when she tried out in junior high—begs her to join the team. And Craig asks her to come to his Halloween party, revealing he’s going as a masked Galaxy Man. Galaxy Man is the star of Ren’s favorite movie, and she begins to suspect cheering and Craig’s interest are happening because she’s wearing her new shoes. At the party, Ren and Galaxy Man talk and kiss, but before she can unmask him, he runs away. Over the next week, Galaxy Man visits Ren, and she falls hard for this shy, awkward version of Craig. Her life couldn’t get better. Except, Ren’s now failing trig, and she keeps fighting with Kalli—who’s worried about Ren’s shoe obsession. And Ren cringes whenever she wears her favorite vintage. As for Craig? He’s not as much fun as Galaxy Man. If wearing her sparkly shoes makes her dreams come true, Ren will have to decide if her wishes are worth the price. She can either wear her shoes forever and have the things she’s always hoped for, or throw them out and go back to her former, geeky-boring existence. Complete at 61,000 words, A PERFECT FIT is a young adult romantic comedy. It’s a contemporary, non-magical twist on ELLA ENCHANTED, with hints of THE SUMMER I TURNED PRETTY, by Jenny Han. 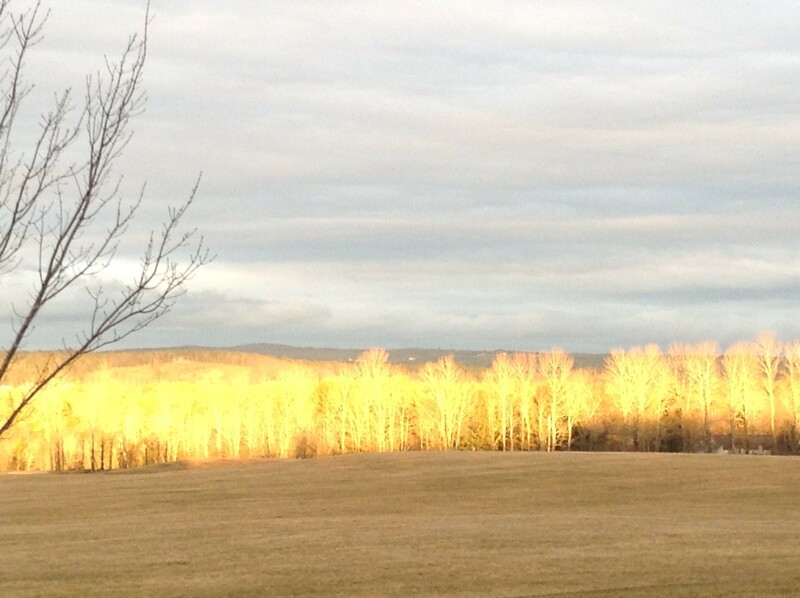 This is a picture taken of the field in front of my house at sunset. The bare trees look like skeletons on fire!